With proven results in some of the most grueling industries, Selkirk College biology instructor Dr. Delia Roberts is bringing her expertise in the field of health and safety to a new level with an exciting new program that trains the trainers. A safe and healthy workplace is a reality within reach of every organization regardless of its size and Selkirk College biology instructor Dr. Delia Roberts is getting set to share her knowledge on how it can be achieved. Starting this fall, Selkirk College will be offering a citation in Integrated Worksite Health & Safety which provides an opportunity for organizations to inject a new level of wellness, prevent injuries and create a more productive workplace. Under the expert guidance of Roberts, the online courses will enable participants to take control of an issue that costs millions of dollars each year. Selkirk College biology instructor Dr. Delia Roberts as developed a train the trainer program that takes aim at a safe and healthy workplace. Roberts’ knowledge in the field of workplace health and safety is extensive. After 14 years of working with some of Canada’s highest level Olympic athletes in Calgary, Roberts arrived at Selkirk College in 1998 to take a position teaching in the University Arts & Sciences Program. 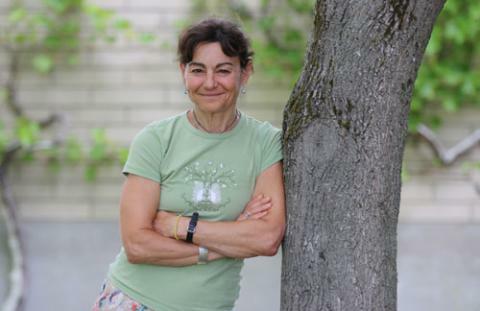 In 2000, Roberts took her years of experience in the world of sports science and applied it to a forest industry supported research project aimed at reducing injuries to tree planters. With outcomes like a consistent reduction in injuries by 40 to 90 per cent, her work has gained international recognition due to its exceptional effectiveness. Over the last 14 years, the success of Fit to Plant has branched out into a multitude of industries where stress on the body and/or mind leads to costly injuries for both individuals and organizations. Roberts has applied her principles to truck drivers, medical professionals, ski industry employees and most recently hand fallers who toil in the forest industry. The new Integrated Worksite Health & Safety citation is a slight departure from Roberts’ previous work. With the aim of building in-house capacity, she has designed the program for those currently employed in human resources or health and safety departments. Participants will gain the knowledge to evaluate the specific needs of their worker population. They can then use the tools to identify and deliver a sustainable health and safety program for their organization. “By the completion of the course participants will have the ability to look at their organization, analyze where the problems lie, pull the resources together to design and implement a program, present an argument to management about which components are important, and then actually run an effective and sustainable program,” says Roberts. The program consists of three online modules: An Introduction to Integrated Worksite Health and Safety, Introduction to Nutrition Science for the Workplace and An Introduction to Movement Science for Worksite Health and Safety. The course is designed to be a manageable workload for someone who is fully employed, requiring six to eight hours a week including homework time. Each week will consist of an assigned reading with a set of questions to direct the learning, followed by an online forum with all participants and a mediated discussion led by Roberts. In addition, the assignments within each module direct the learner to identify the key elements specific to their workplace and build an integrated health and safety program for their own organization. Each module will take 12 weeks to complete. Having worked with organizations like WorkSafeBC, Roberts knows her programs are effective. They are reducing workplace injuries, cutting down on absenteeism, trimming turnover, eliminating mistakes and improving productivity. Though larger organizations have more capacity to implement health and wellness programs, Roberts says size doesn’t matter. Learn more about the Integrated Worksite Health & Safety citation and join us on Facebook.